Romantic Adventures go above and beyond Qatar most stunning attractions. In your own private plane, experience intimate aerial view of the Mangroves or soar over until the breathtaking Doha Skyline. This unique adventure is guaranteed to last a lifetime and perfect for special occasion. 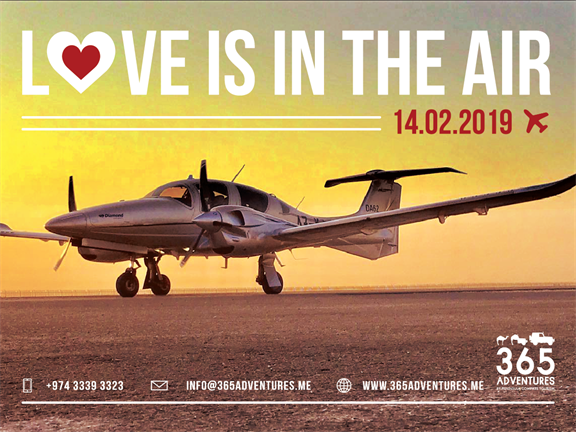 - Board the Piper Archer aircraft solo or with a partner to enjoy a thrilling ride with our certified pilot. - A magnificent aerial view of nature’s gift, the Al Thakira mangrove reserve and the Purple Island. - Fly over the gorgeous Al Bayt stadium which is the proposed stadium for the 2022 FIFA games. - Enjoy some thrilling flying moments for the adrenaline kick with our skilled pilot. - Board the Piper Archer aircraft with a special partner to enjoy a thrilling ride with our certified pilot. - Enjoy some thrilling flying aerobatics for the adrenaline kick with our skilled pilot.